Jetspot Nitro Fiber has been there for a while, but we have just updated the plans and capacity restrictions for apartments and society today, since our fiber nodes are very much spread now. JetSpot Nitro Fiber is basically only available for big apartments and societies, where we can install our dedicated equipments to be able to deliver such kind of speeds upto 100Mbps. And no doubt the capex is huge to deliver a customer over fiber, so we only fire up when we see good number of ready to subscribe customers. To make more and more customers be able to experience the thrill, we are now ready to fire up Nitro Fiber in apartments, which has even 10+ ready to subscribe customers, provided the apartment is very near to our JetSpot Fiber Node. So, we need to see, if we are feasible once we get the inquiries. So the installation amount will vary on case to case basis. How to get Nitro Fiber ? Lets say you are from a society/apartment which has a good number of families staying already. You need to fill the booking form and discuss the details with your society secretary or president. Once they are ready for the meeting with our manager, then we schedule the meeting. We will hand over our brochure and agreement letter in the meeting. Then the society needs to announce about JetSpot Nitro Fiber to all of theirs owners or tenants in society meeting. Our managers will attend the meeting and they will be carrying the Registration Form with them. All the interested customers have to fill the CAF and submit their documents and pay their installation token amount. Once we have 10+ CAF filled and installation amount collected, then we start the deployment process. It takes 3-5 working days depending on the feasibility of your society to set everything up. The society has to dedicated secure space and 24×7 live electricity with backup to JetSpot Team. Once the setup is done, then we start laying cable to each house in the society and we start connecting one by one client and only collect their subscription payment. Subscription and installation both are non-refundable. EXISTING APARTMENT/SOCIETY CUSTOMERS, HOW to get Nitro Fiber ? We will need to re install our node in existing apartments or societies, so we will look for new 10+ customers, and once we see the capacity ready, then the equipments to be replaced at the node and then then activation can happen. You may email us at hello@jetspot.in asking for your plan change, so we can register your request and we will notify once we have the capacity ready to the node upgraded. An existing apartment customer can surely upgrade to a Nitro Fiber Plan, by paying either the 6M or 12M or 24M package anytime. 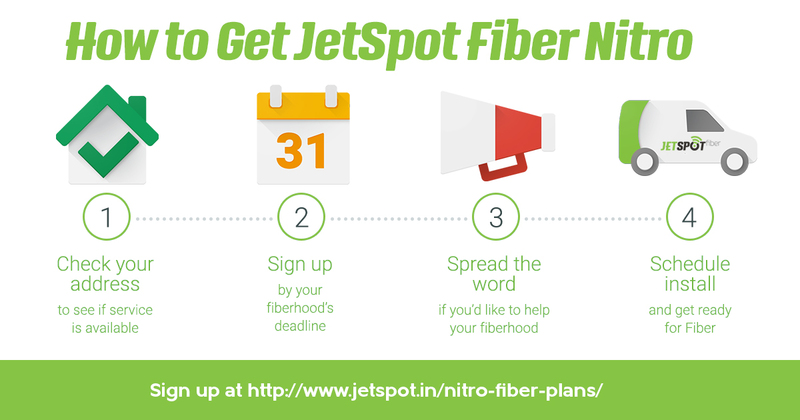 NOTE : Currently JetSpot Nitro Fiber is only available for apartments and societies in Sahid Nagar, Bapuji Nagar, Patia, Raghunathpur, Jayadev Vihar, Niladri Vihar, Shailashree Vihar, Maitri Vihar, KIIT Square, Chandrasekharpur. 1. Installation amount is non-refundable and there is no security deposit. 2. Subscription rental amount is non-refundable once paid. 3. Subscription once started, cannot be paused/cancelled/stopped. And if you are an existing long term recharged residential fiber plan customer, you cannot change to this as well, since you already have an active subscription. You may subscribe this as new plan, if you want and lose the old subscription. As per the law of nature or the system, rental amount once paid, cannot be refunded or adjusted, whatsoever. 4. Account transfer is not allowed. 5. Feasibility will take 1-2 days. 6. Installation Amount will vary and will be decided on case to case basis. 7. Installation Type will be FTTH or FTTB or FTTN or FTTC.